And so it is with our central question in Great War at Sea: High Seas Fleet: Germany could have built an even more powerful fleet by 1914 than was actually the case; if she had, how might it have been used? There’s no doubt that Kaiser Wilhelm II and Admiral Alfred von Tirpitz would have gladly built more battleships yet they didn’t fail to do so because of ignorance or stupidity. They faced many challenges: the Krupp-Dillinger armor monopoly, the Reich’s complicated tax structure, the inability of German industry to produce effective turbines, and the massive profiteering by the Navy’s suppliers among others. Still, the industrial capacity and the political will (at least at the top) were there. Had these managed to come together the High Seas Fleet would have been far more powerful than it was in reality. In a previous installment we looked at the German battleships added to the fleet in High Seas Fleet. Today we’ll take a look at the cruisers. While the Germans placed great faith in their battle cruisers, they proved incredibly expensive and not until very late in the process did they start ordering them in full-sized classes with the Mackensen class under the 1913 fiscal year program. Part of the expense came from the monopoly of the Blohm und Voss yard in Hamburg on their construction, an arrangement not disrupted until Hindenburg was laid down at Wilhelmshaven’s Imperial Dockyard in 1913. By building some dreadnought battleships in Imperial dockyards, Tirpitz helped keep costs down for ships built by private yards through competition. But the state facilities lacked Blohm und Voss’ experience with turbines, and Tirpitz apparently also hoped to prop up competition for the Krupp combine by giving the most lucrative contracts to a non-Krupp yard. Had Tirpitz obtained the funding to build battle cruisers in pairs, and placed the second order with an Imperial yard, he might have strengthened his hand in the long term. But the Grand Admiral did not believe he had a long term, and needed to build his fleet strength as quickly as possible. In High Seas Fleet, we start the battle cruiser expansion with a sister ship for Germany’s first such ship, von der Tann. This sister is named Jachmann for the founder of the modern Prussian navy, who commanded the fleet in action off Swinemunde in 1864 against the Danes. Von der Tann was a much better fighting ship than the first British battle cruisers. The next German battle cruiser design, the Moltke class, was a larger and more capable ship, and two were constructed so we did not add any in High Seas Fleet. The fourth battle cruiser, Seydlitz, again was ordered as a single ship and so we added a sister, here named Zieten after another of Frederick the Great’s generals. The following generation of German battle cruisers represented a serious step forward in design and fighting power, and a staggering jump in cost (a 27 percent increase over Seydlitz). Since we’re playing with German taxpayers’ money here (what’s a few pfennigs more per liter of beer? ), we’ve added a fourth ship to the three-ship Derfflinger class, named Schwerin, honoring yet another Prussian general. We looked at the German armored cruiser Blücher in a previous Daily Content piece. Fast, well-protected and well-armed, she was the finest armored cruiser ever built – and obsolete the day she first hit the water. British battle cruisers had eclipsed the armored cruiser as a ship type, and while her 8.2-inch guns were a match for the 9.2-inch weapons the Germans expected the new British cruisers would carry. Instead their 12-inch guns left her badly overpowered (but not outranged). Tirpitz had hoped to lay down six of the big cruisers, the most expensive warships built in Germany up to that moment. Kaiser Wilhelm II for once provided the voice of sanity and only one ship was built. In High Seas Fleet we provide the full class with five more examples. All six ships have been given new gunnery ratings more in keeping with their capabilities, with a powerful secondary gunnery rating but no primary guns. They’re unique ships, able to absolutely annihilate smaller cruisers but at a huge disadvantage against enemy battle cruisers. If used as super-cruisers instead of weak battle cruisers, they might be very effective for the German player – but they certainly won’t justify the investment. We’ve also included the armored cruisers Scharnhorst and Gneisenau, which appear in Cruiser Warfare. Like Blücher they’ve been properly rated, and they have a much better drawing on their pieces now. And they see use in the scenarios as well, with the German player trying to shepherd them home on the final leg of their journey. The older German armored cruisers that had “nominal” primary gunnery factors in Jutland are also given new ratings (and pieces) in High Seas Fleet. Like their British counterparts, they lack the speed to do much for the main fleet but will still see employment on occasion. The High Seas Fleet experienced a shortage of light cruisers throughout the war. Not enough of them had been ordered to begin with, with the big ships given priority, and more of those that were built went to overseas stations than had been anticipated. In our book we’ve given the High Seas Fleet a few more light cruisers, but tried to keep their proportion at the actual level, more or less. There are two more members of the Rostock class laid down in 1911. Both Rostock and her sister, Karlsruhe, were lost before their armament of 105mm guns could be upgraded to the far more potent 150mm pieces, as was done with other German light cruisers in 1915 and 1916. We’ve given Würzburg and Flensburg the bigger guns from the start, and in the scenarios other German light cruisers appear with their modified armament earlier than was the case in the actual war. The Wiesbaden class, laid down in 1912, gets two more members, Potsdam and Göttingen, as does the Wiesbaden class of 1913, here named Freiburg and Konstanz. Even with these additional ships, the German player will find his or her torpedo forces much less well-supported by cruiser guns than the British flotillas. 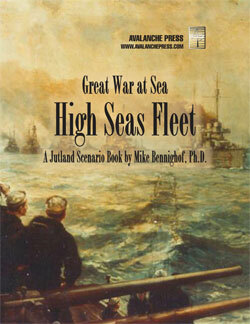 Click here to order High Seas Fleet right now!